My 36 year old sister died December 3, 1989 in a one car auto crash. It was an incredibly tough time on our family, most notably, on my Dad who Steph always relied upon. It was during this time that I first saw the strength of character in my Mom, Gertie. I'm sort of hoping that Mom holds out until Sunday so that she can go join Dad and Steph on what would have been my sister's 59th birthday. Part of me hopes so but part of me just wants her to go in peace whenever. It is now, as she lies in her hospital bed in my living room, facing the last moments on earth that I see that strength of character again. 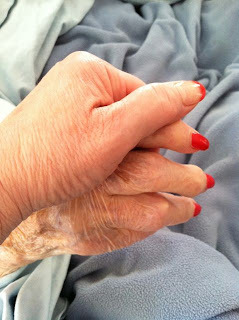 Hospice workers are amazed that she's still here with us but I'm not. I've seen that strength many many times during the past 5 years that I've been her caregiver. She's taught me many important lessons and we've shared many good times and laughter. We've known the warm love surrounding us from friends and family - my online friend have been an incredible support system to us both as I read their words of love or encouragement to her. Here's my latest and probably last article for a while: Death and Dying - dealing with the restless patient.